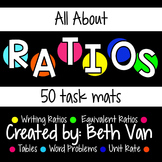 This is a fun scavenger hunt in which students practice writing ratios in fractional form, with colons, and in words. 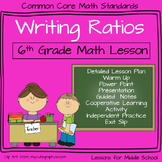 Students make comparisons while writing ratios using commom items found in the classroom. 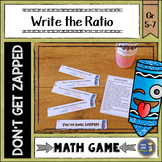 The scavenger hunt may be modified to suit your own classroom. 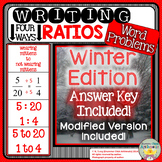 Four pages of writing ratios the three ways, simplifying ratios, and word problems. 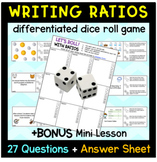 Great for class practice or homework. This is a 24 problem worksheet where students look at two different colored marbles and write a ratio comparing them by using the word "to". This is a 24 page smartboard lesson where students look at the color of marbles and compare them. 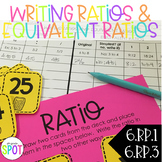 The students write a ratio using the word to. 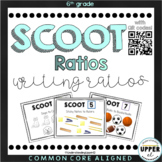 Writing Ratios SCOOT activity - with AND without QR Codes! 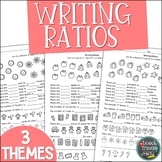 Writing Ratio Fill-in-the-Math. This correlates with VA SOL 6.1. 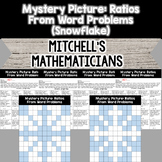 Answer key and student worksheet included.